A contemporary way to display your air plant. Perfect for any situation - decorate your home or office, this ornament will sit anywhere! Supplied as a ceramic head sculpture with airplant included. Air plants are one of the current must-have indoor plants, with stocks selling out as fast as we can get them in! Everyone wants one of these easy-care gems, and the ways to display them are ever inventive. These multipurpose plants are suitable as decorative houseplants for any style of home - plus air plants have the added bonus of being able to help clean the air in your home by helping filter out impurities. This kit is a contemporary way to display your air plant - a stylish, geometric head sculpture with air plant hair! Featuring a white ceramic head sculpture, this perfect, easy-care, low-maintenance houseplant kit will be delivered direct to your door in perfect condition ready for you to display. The air plant included with the planter is a top quality, healthy, nursery grown plant and it'll be delivered direct to your door in perfect condition. 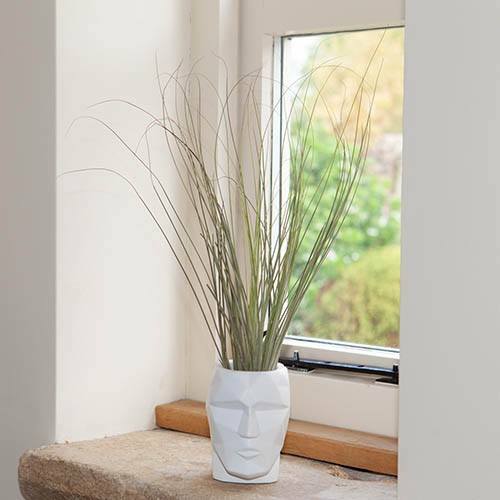 Supplied as a ceramic sculpture head with quality airplant included. Head is approx 12cm tall. Total height including plant approx 45cm. The perfect low-maintenance houseplant, these air plants really do not require much attention at all, making them the perfect choice for adding a bit of life to a room but with very little effort. They grow without soil, so can be mounted or grown in a whole range of containers and supports - but do remember that they are living plants and do require watering, despite thier name, they don't thrive on air alone!